Neuwied is a town in the north of the German state of Rhineland-Palatinate, on the right bank of the Rhine. It’s some seven or so miles northwest of Koblenz, on the railway from Frankfurt am Main to Cologne, and has a population of around 65,000. If you check out its list of ‘notable residents’ around 1800, you’ll hardly find any name to conjure with, and certainly not that of composer, Johann Martin Friedrich Nisle. Equally, in terms of discography, apart from this present release from CPO, the only other recording of any work by this composer would appear to be a coupling with another lesser-known, but certainly more familiar name to aficionados of music of the period, Ferdinand Ries (Globe GLO5230). Here, on a recording entitled ‘Out of the Shadow of the Masters’, the advertising two-liner informs us that ‘Ries had lessons from Beethoven and copied out his music to earn enough to live on. He was also much praised for his performance of a Beethoven Piano Concerto for which he composed the cadenza heard on the CD’. On the other hand, Nisle’s mention just amounts to the name of the work recorded. There is a raft of less-well-known composers’ music being increasingly heard today – and many, thankfully, courtesy of this proactive German label. The bottom line is whether Nisle should have been left in relative obscurity, except, perhaps for those interested in musicological research. Does he have something of merit to say, which would have a greater audience appeal? CPO would seem to be of the latter opinion having recorded not one, but three of his works here. These apparently date from between 1806 and 1809, and are thought to have been written in Vienna or Hungary. As the sleeve-notes suggest, there is certainly an evident ‘bright mirth and southern warmth’ almost the whole time. The opening theme of the Octet – scored for flute, clarinet, two horns, two violins, viola, cello and double bass (the latter two double each other at the octave) – is rhythmically of some interest, and certainly catches the listener unaware. Again the sleeve-note suggests a certain similarity here to the Turkish music popular in Europe at the time. The ensuing development emphasises minor tonalities, rather dissipating the sunnier nature of the exposition, which is then followed by a somewhat condensed recapitulation. The second movement is a fairly standard Theme and Variations on a simple, song-like melody, where essentially clarinet and flute come to the fore as soloists. The Octet can, in fact, be played as a Sextet, as the two horns are shown as ‘ad libitum’ on the work’s title page. There are some captivating textures along the way, and especially as the end is approached. The clarinet leads off the jovial finale and, in fact, is given the majority of the musical action, although the violin does get the briefest of cadenzas halfway through, and the flute shares some of the runs a sixth apart. Essentially it’s cast as a Sonata-Rondo, which combines elements of both these well-used classical forms. The Septet in E flat – scored for flute, clarinet, horn, bassoon, violin, viola, cello and double bass (doubling as above) – opens with an almost Mozartian swagger, as well as a passing resemblance to Beethoven’s work in the same key. Again the woodwind instruments tend to dominate, usually as soloists, or paired, often in such traditional fashion as with flute and bassoon, two octaves apart. This sonata-form movement is followed by a ‘Menuetto’ in the same key, which combines Viennese elegance with music of a far earthier and humorous nature in the ensuing ‘Trio’, with its distinctive folk-like ‘Ländler’ quality. The third movement is a pleasantly melodic ‘Adagio’ which, for the first time in the work, gives cello, horn and bassoon some brief opportunities for display. The finale is a rollicking ‘Hunt’ theme, set in conventional 6/8 time. Here the woodwind all share in the fun, with strings largely supplying a harmonic backing and link between the episodes. There is a charming moment just before the return of the rondo theme, this time introduced by the horn, where Nisle quite blatantly precedes this with a note-for-note quotation from the finale of Mozart’s Horn Concerto No 2, K 417. The bassoon has some display opportunities in the second episode, while the final entry allows for some delightful interplay between flute and clarinet, bassoon and horn respectively. This is followed by a strangely searching passage in remoter keys, and slower in tempo, before the ‘hunt’ them resumes and leads to the work’s conclusion, but again with some further surprises in terms of harmony, rhythm and tempo, before the music reaches its joyful conclusion. To put these ‘surprises’ in perspective, Beethoven had already composed his first four symphonies, and even from the very opening of the first symphony, there are many more, and far more substantial examples to be seen in his output even at that stage of his development. The first movement of the Quintet in C – scored for flute, horn, and string trio – makes a refreshing change, in terms of its formal construction. It has an opening, essentially extended slow introduction, beginning ‘Adagio’, and moving into a lilting ‘Andante quasi allegretto’, all of which precedes a most sprightly dance-like ‘Alla Polacca’. Throughout, the strings have a more important role in delivering the various melodies heard, and, whereas the clarinet was largely the star of the two previous works, here, the horn becomes far more dominant. 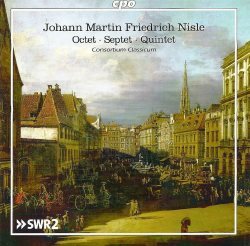 Nisle actually came from a family of horn-players, and the composer’s father, Johann Nisle (1735-86), enjoyed a virtuoso’s renown as a prominent member of various court ensembles in the area, and respect as a teacher. The second movement presents a somewhat stately ‘Menuetto’, where, after a concerted opening, which gives a little freer rein to horn and violin, the trio offers a contrasting section, where flute and horn have some greater prominence, both as separate lines, and in combination. However, after the ‘Menuetto’s’ return, Nisle adds a second trio, this time in the relative minor key, and where the music is decidedly more melancholy in character, a feature which its lower-range melody enhances. This is immediately followed by an ‘Alla Siciliano’ which is given out first on the horn, and with distinct pastoral overtones, which the occasional bare-fifth harmonies emphasize. This develops into a short set of variations, where again the horn takes the first slot, followed by an effective shift into the tonic minor, with the cello getting its change to sing out an expressive melody, which a little help from the horn. The music returns to the major, where pizzicato cello initially provides a particularly effective bass in a short, appealingly-scored passage. A coda concludes this movement, and ends on an imperfect cadence – i.e. waiting for the next movement to resume in the home key. All very straightforward, it might seem, as, according to an untranslated footnote in German below the movement timings here, that, according to the score, movements three and four are actually considered as a single entity, effectively the finale to the Quintet. Even the short 6/8 ‘Allegro ma non troppo’, with its somewhat demanding horn part, which rounds the work off gently, rather than dramatically, and where the violin has the final word, seems nothing out of the ordinary. However, closer listening will confirm that the Quintet doesn’t end in its home key of C, but a tone lower, B flat major. True, there are other instances of this happening throughout musical history, but it’s certainly a real novelty here, even if there is strangely no mention of this in the notes. Those with ‘perfect pitch’ should immediately pick up on this, of course, but for those without, just play a few bars from the opening ‘Adagio’, followed right after by the start of the finale – all should then be revealed. The recording itself is first-rate, and Consortium Classicum are very much at home in music of this style and period, as witness their many other recording s for the CPO label. While the sleeve-notes are informative overall, there are certainly instances where the English translation is not overly clear in communicating what the original German text conveys. For example, when talking about the opening of the first work recorded, translator, Susan Marie Praeder writes: ‘An original »indented« [sic] sixteenth figure presented in unison by all the instruments opens the extended first movement…’ Günther Grünsteudel’s actual German text, when translated, might be better phrased: ‘An original figure in ‘spiky’ sixteenth-notes (or semiquavers), given out in unison, opens the extended first-movement…’ Just a small niggle, but technical translations, such as musical sleeve-notes, ought, perhaps, to be made by translators whose first language is that of the translation, rather than of the original foreign-language text. Clearly the strange anomaly with regard to the final key at the close of Quintet wouldn’t, in itself, justify recording the whole work, or indeed the other two examples of Nisle’s oeuvre. However even at a superficial level these three works are most enjoyable. While not really contributing anything that Ries, Spohr, Czerny and the like have not already said, CPO are to be congratulated at least for giving music-lovers in general, as well as those with a specific interest in the music of the time, a fresh name to add to the pile, as well as two previously-unrecorded pieces of chamber music.